Recorded in Exeter College Chapel, Oxford, April 2011. 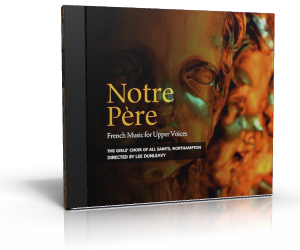 NOTRE PÈRE is a follow-up to the acclaimed 2004 recording from the Girls’ Choir of All Saints, EN PRIÈRE. The generous acoustics and French-inspired organ of Exeter College Chapel, Oxford, provide a wonderful backdrop to nearly seventy minutes of French music for upper voices, much of it not previously recorded, and including music from the seventeenth to the twentieth centuries. Beginning and ending with two great Mass settings, with a large setting of the Magnificat and twelve motets, there is a remarkable variety of colours and melodies. The booklet that accompanies the disc includes comprehensive notes on the works performed and the artists featured, and full texts and translations can be downloaded here. We were delighted once again to return to the splendid chapel of Exeter College, Oxford, to make use of their J.W. Walker & Son organ, the only instrument in either Oxford or Cambridge to be designed in the style of the great French organ builder Cavaillé-Coll. Further details of the organ and full specification can be found here. * items marked with an asterisk receive their first recording on this disc.